84 hours (3.5 days) without solid food. I thought it would be easy. The hospital gave me two $3 coupons for Ensure®. They said do the clear liquid diet and have 3 Ensures® a day. The Ensure® would give me the protein I needed for the next two weeks, plus some calories, plus some vitamins, plus some minerals, etc. Fourteen days times 3 bottles per day equals 42 bottles of Ensure® to get me through my 14 days. All I’d have to do was plunk down the coupons, my credit card and 42 bottles of Ensure® and I’d be set. But life isn’t so easy in the bewildering world of consumer choice. What I was faced with was a floor to ceiling display of nutritional supplements of various prices and various names and various claims made by various manufacturers. Even within the Ensure® line, there was another bewildering choice of formulations for each and every problem and body part. Toe nails need strengthening? There might be a formulation. What should’ve been a no-brainer, turned into 30 minutes of mental anguish. How’s a person expected to recover with this kind of added stress? 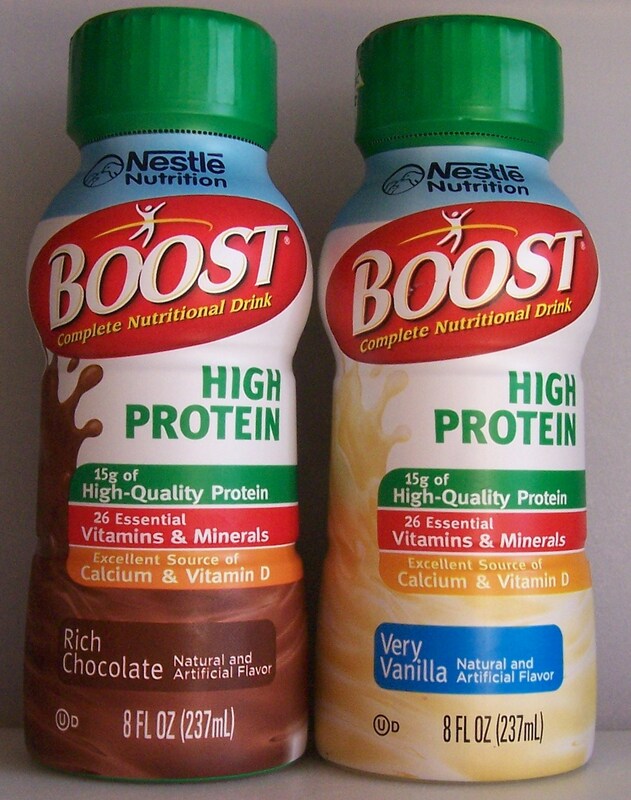 Among the many were several six packs of High Protein Boost® for 66 cents a bottle. It appeared to be some sort of inexplicable mark down. That was less than even the case size of Ensure® minus the $3 coupon. Plus, the Boost® was High Protein. The dietician said part of what I needed was protein. So in the end it was a no-brainer, more protein less money. Now let’s talk about the protein. If the supplement was to help cover my protein needs, shouldn’t there be enough protein in 3 bottles per day to do that? That would logical and simple. But no, even that can’t be logical and simple. Remember we started with a clear liquids diet (stuff we can see through) except that was contradicted by the Ensure® recommendation, which is as opaque as a milk shake. So why should a simple calculation of protein requirements be any less contradictory? The first problem is, no one really agrees on what our daily protein requirement is. However a good guess is 46 g for women and 56 g for men, per day. Standard Ensure®, and similar products, have 9 g of protein per bottle. Three bottles times 9 g equals 27 g per day. That’s well short of even a woman’s requirement. Even the high protein (15 g) Boost® formulation barely meets a woman’s requirement and falls short of a man’s. Where’s the Aflac duck? Good thing I have these important things to ponder. I have less time to feel sorry for myself. I suppose that’s really the hospital’s game plan. Things I’m missing day three, guacamole. Avocados are only 39 cents each at ALDI this week. Can guacamole be frozen for 11 days? This entry was posted on 03/03/2012 at 09:00 and is filed under Recipes, food, cooking and related items. You can follow any responses to this entry through the RSS 2.0 feed. You can leave a response, or trackback from your own site.